Britishizing: Adapting to British customs and mannerisms. Conforming to a British lifestyle. If you’ve been reading my Facebook updates, you’ll understand that this post has been a long time coming. I never considered accents much back home in Canada. I knew my maternal Grandparents had thick Polish accents and that my favourite professor had a South African accent but not much else. I hardly consciously noticed these things. 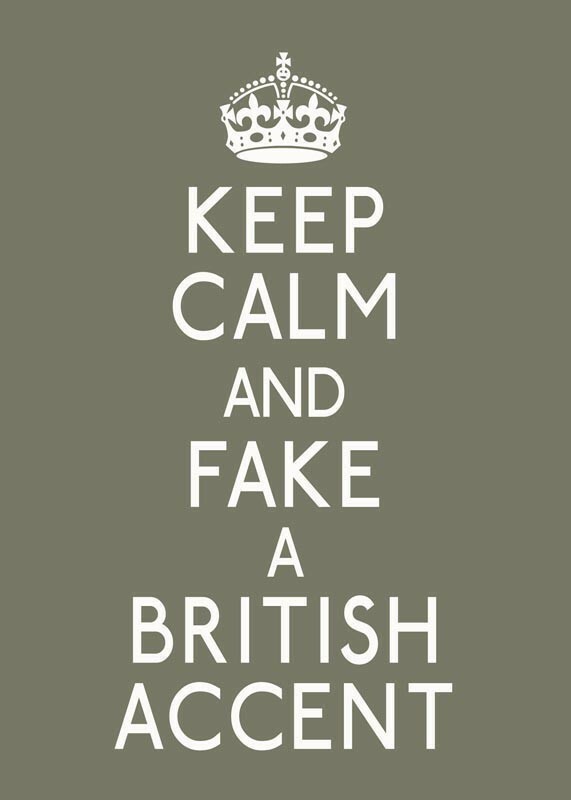 And I certainly never gave my own accent much thought. That is until I arrived in England where I immediately felt different from the moment the plane landed on the British tarmac. The following weeks illuminated the situation. In a culture where everyone’s favourite pastime is “winding you up” or “taking the piss,” my accent was/ is something of a target, particularly when people (especially relatives) realised there was no greater insult than to call me American. I was laughed at for numerous pronunciations of words that were “so American” and it didn’t matter how many times I said them. It never ceased to be amusing. Take for example the word “Awwww!” which is according to my housemate is, “So American and so annoying!” I mean, who says that? You’re basically saying you hate the way someone speaks when they can’t avoid it. Another word that’s apparently quite humorous is “water.” In England, you either strongly pronounce the “t” sound or pretend it’s not there at all. Then there are the numerous terms that are the bane of my existence, causing anxiety at the mere possibility I might have to say them. And that’s just the starter list! So, I plead with the Brits, please remember I’m just an ignorant foreigner (which I know you take pleasure in reminding me of anyway) and that I’m still learning to adapt to your confusing speech patterns.